In Bavaria, Germany, crosses are ordered to be placed in government buildings. The Christian Social Union, ruling party of Germany, has made a decision to hang crosses again in the state buildings. Archbishop Schick: "Hanging up the cross and making it clear as a sign of unity, reconciliation, peace, brotherhood and solidarity is, of course, good. The cross is the cross of God's culture, and that is always a culture of love, the civilization of love. If one interprets the cross in this direction and makes it clear to all people in Bavaria, the Federal Republic and the whole world, then it can really lead to a society of reconciliation, peace and justice. Auxiliary Bishop Ulrich Boom: "The hanging of crosses in state buildings is initially a state matter. Wherever it is, it is not a martial issue for Christians in dealing with other cultures and religions. Rather, it should encourage the commitment to justice, to the work of people in need - and especially for refugees. For the cross is a sign of the nearness and humility of God, a sign of service, love and charity. It is the love sign of God par excellence - a plus sign that many people are waiting for because there is a minus in their lives. 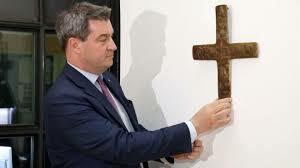 From the CSU, I hope that their members see the cross in this Christian meaning and not first as a commitment to identity and cultural heritage in Bavaria. I hope everyone that the cross is not used for the election campaign and instrumentalized for political interests. " Leader Dr. Hans Bauernfeind: "The cross is our most primeval symbol and I am generally pleased when people find access to this cross because there is a message for every human being in it. The message of death and resurrection, of charity, of mercy and that we all can hope for salvation. That is why I am happy when I am allowed to look at a cross in a room, a house and in our churches. The cross has its own message that can not be harnessed for other purposes, be it political, social or cultural. The cross stands for the message of Jesus Christ and it claims that people are served. " The press office cited the statement of Bishop Heinrich Bedford-Strohm : "I am pleased that crosses are visible in public. Religion can not be banished to the privacy sphere. Crosses are a kind of public commitment to what constitutes the content of the cross: humanity, charity, human dignity. We Christians believe that God meets us as human beings in the one who died as a torture victim on the cross. Therein lies the deepest reason for our commitment to the weak. It is precisely the cross that repeatedly makes it necessary to critically question politics when it comes to overcoming poverty, engaging in a humane refugee policy or overcoming war and violence. "